"I send my money offshore so that foreign investors can invest in a foreign entity!" Politicians always have some skeletons in the closet and when they start running for election, those skeletons seem to find the light of day one way or another, and that is when candidates either ignore those problems or try to explain them away. Mitt Romney, the supposed Republican front-runner has had a series of gaffes since he started running four years ago and most recently was the revelation that Mitt Romney, the man who is supposedly for American businesses and the middle class, has kept his money in overseas tax shelters. Romney was recently confronted about this from a voter at a town hall event in Maine on Friday and Romney did what Romney is horrible at doing - explaining himself. The problem with Romney's explanation is that it makes absolutely zero sense. "Do you think it's patriotic of you to stash away your money in the Cayman Islands?" a voter asked Romney. Romney explained that he doesn't manage his millions - he has a blind trustee do that for him so that he "wanted to make sure [he] didn't have a conflict" when running for office. He also claimed that he didn't save money on his taxes by shipping his money offshore. 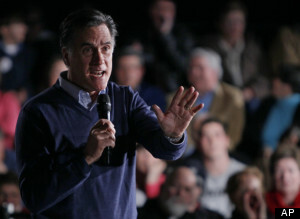 "I have not saved one dollar by having an investment somewhere outside this country," Romney responded. "The investment in an offshore account was to invest back here in the United States and the reason it was there they explained was so foreign investors could also invest in that entity. So I pay all the taxes I'm required to pay under the law, and by the way, not a dollar more. Thank you." Romney's tax lawyer, Brad Malt, had some things to add. "There have been reports that these investments are evading taxes," said in a conference call when the tax returns were made public. "Again that is flatly wrong...The blind trust's investment in the Cayman funds is taxed the same as if Governor Romney made the investments himself." The comments from Romney's camp do not pass the smell test. Romney claims he did not save any money on his taxes and that he paid what was required by law. This statement is technically true. Romney was able to navigate some loopholes so that he was able to pay some lower taxes. Romney also makes the claim that he invested his money in some foreign accounts so that that money can be reinvested back in the United States, but in his explanation he also states that his investment was so that "foreign investors could also invest in that entity," meaning entities that are not American would invest in a non-American entity because Romney sent his American money elsewhere. And that is bringing investments to America how? Basically Romney was caught being rich while he continually tries to masquerade as one of the middle class. He jokes about being unemployed, he talks about the struggles of the everyday man, but when the focus is turned on him and when voters ask for a serious answer, Romney can only give a lame excuse as an answer, and that is because he cannot simply come out and say that he has never given a hoot about the middle class - only his name and legacy as a hero for the wealthy (which he is one of).